Roger Kizik must live with a paint box in one hand and a tackle box in the other. 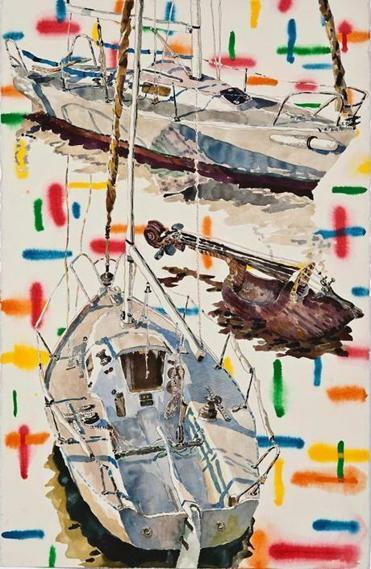 The former Navy man is now an old salt, and “Roger Kizik: Gone Fishing,” a summer breeze of a show at Room 83 Spring, celebrates the painter’s maritime passions with his trademark fluidity and humor. Jam-packed with everything from small watercolors painted on the fly to large constructions, all burbling with shimmering tones, “Gone Fishing” has the giddy pull of a day in the sun. Kizik specializes in mirages. His watercolors, such as “Teal,” which sets a boat against an unearthly fuchsia sea, are shimmers on the verge of dissolving. In his larger works, he deploys perspective, color, and loose, prancing gestures to pull you into illusion. For “Voyaging Under Sail,” a portrait of Eric C. Hiscock’s book of that title, he cut a large panel in the shape of an open book. The cover splays to reveal a boat’s deck, placing us at the helm. The prow bounces over cobalt waves, and the sky arcs over the horizon. Kizik nods to the artifice of it all — it’s a painting of a photo on a book jacket, for crying out loud — even as he blows salt spray in our faces. Although every glint looks cavalierly dabbed on, Kizik has exquisite control. “Simpatico” features cutouts of watercolors of boats against a ground of spare dabs of ripe color: A swipe of yellow, a smudge of pink, just enough to hint at light glinting on the water. Two sailboats, their delicate masts and rigging sliced thin and jutting to the top of the page, are moored alongside a violin made of a wooden shoe, which Kizik has turned cheekily into a boat. That image comes from a story about a challenge the great violinist Niccolò Paganini once took on, to play in public on a violin made from a sabot. Kizik’s efforts here seem less about pride and more about play, the heady cocktail of paint and the sea, and the long dream of summer. Eric Zener’s “Emerald Blanket” at Lanoue Gallery. It’s hard to resist Eric Zener’s gorgeous paintings of water and swimmers at Lanoue Gallery. He’s a photo-realist and an old-fashioned seeker of the sublime. He knows how light waffles through water; he knows the complexities of a bubble. “How to Be Happy” says it all: a submerged woman surrenders to joy, her hair floating and bubbles hovering in the luminous blue. Other paintings start with gold leaf on wood panel, over which Zener attaches a photo transparency. From there, he layers (and layers!) paint and clear resin. It’s like looking through water. In “Emerald Blanket,” a boy shoots diagonally through water, a plume of bubbles rushing off him. His skin is sun-burnished with gold; painted bubbles rise to the surface of the painting. 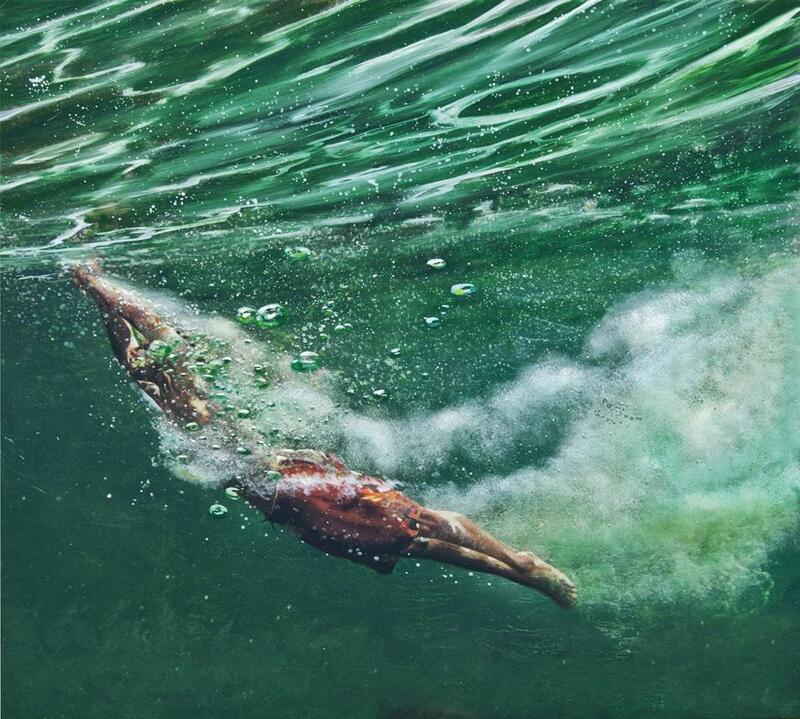 Pieces like these make the rush of cool water almost palpable. I have one quibble. The people in Zener’s paintings are all beautiful, toned young white people. Is the sublime exclusive? Would such paintings feel any less ecstatic if the swimmers were people of color, or old, or round? Marc Harrold’s composite photos (also at Lanoue) get to the essence of the beach. In the diptych “Beach #80 and Beach #81,” silhouettes of bathers frolic and wander along the shoreline. A soft blue-lavender froth of water licks the horizon. Harrold has scrubbed the sky to pure white, but he leaves its reflection — painterly peach, teal, and bruised gray — in the wet sand. The image is so sparely black and white that the pearlescent tones rivet the eye, as if this is the moment of summer that we will forever remember. Each of Nathan Prouty’s works at Lacoste Gallery centers around a small clay form that stands bravely upon, or recedes shyly into, a sparkling stage covered with glitter and resin. Perhaps the gray coil and the green cylinder are mismatched lovers. It doesn’t really matter; Prouty’s audacious stages launch his tiny, blushing ceramic pieces into mythic territory. It’s vulnerability in the spotlight, naked and endearing. Josephine Burr’s ceramics, also at Lacoste, are more self-contained. She draws gummy lines in clay that loop and network, as in “The last bit of light (Pink Cloud Structure).” There’s a sense of something barely held together in these works — the erratic path of an electron, made with earth by hand. In her tile drawing “The fruit of things left unsaid (From the Father Pairs series),” the loops fill two pink speech balloons, which might also be two brains burdened with unspoken thoughts. Great white drips spring along the surface, like tears or beads of sweat. Where Prouty explores the agitation of seeking and fearing attention, Burr divines the consequences of remaining silent.